Maarriage photo of Belle Sparks and George Washington McKenney Jr.
George Washington MCKENNEY, son of George Washington MCKENNEY Sr. and Isabella LOVE was born 2 Sept. 1861 in Iowa. He died 3 March 1947, at the age of 85, in Sedan, Chautauqua Co. KS, and is buried at the Oak Hill Cemetery in Chautauqua Co.
On 3 June 1883, in Elgin, Chautauqua Co. KS, George Jr. married Belle M. SPARKS, daughter of James E. SPARKS and Carrie BURCH. She was 15 and he was 21. Belle was born 14 Jan 1868 in Shelby Co., Illinois and died 28 Dec. 1935, at the age of 67, in Sedan, Chautauqua Co. KS. She is buried at the Oak Hill Cemetery in Chautauqua, along with G. W.
James Albert b. 22 March 1884 at Sedan, married Vera CROCKETT. Direct line. Mabel Clair b. 16 Oct. 1888 at Chautauqua Co. KS, died 11 Sept. 1972, married Frank TRIPP. James Preston TRIPP, who married Mary Sparks MCCORMICK, was father of Frank TRIPP by his first wife Jennie McWhirt. Carrie Isabel b. Nov. 1897 in OK, died 1931. In 1916 she married Jessie C. HAMPTON, b. 24 August 1885 and died 8 March 1965. A couple of stories survive about G. W. McKenney Jr., but that’s it. I was told by family of his sibling Addie that he was attached to family and kept in close contact with family in the Osage area, visiting them. Down our line is the story that he was a deputy and as a teen I saw an old photo of him with a bullet dangling from his pocket watch chain. I’ve also been told that, as a deputy, one night they came by to get him for something that was going on, and that when he returned he said he was quitting but never spoke about the events of the night. What that was about, we’ll never know. My grandfather said he was five feet six inches tall. A newspaper article survives of George Jr’s trip to visit his half-brother Eli in 1937. G. W. Jr. was never a mayor of Chautauqua Kansas. The federal censuses given him in 1900, 1910 and 1920 as living in Belleville in Chautauqua, whereas the the state census in 1905 and 1915 has the family in Chautauqua in Chautauqua county, which is confusing to me. I’ve considered the confusion may have something to do with a known mayor of Chautauqua, a James Bird Jones, who the 1920 census shows next to G. W.’s family. James Bird Jones was, sometime after 1915, a mayor of Chautauqua. He was part Chahta (Choctaw) Indian and his wife was Laura Mae Revelette, daughter of Frederick “Frank” Revelette and Emma Frances Davenport. The Revelettes and McKenneys would have been acquainted with each other prior this, according to the census. 1905 shows the James S. Revelette and Annie Rhatigan family (James was a brother of Laura) living at household 9 in Chautauqua and the McKenneys at household 14. The 1915 census records the family next to Benjamin Sparks, a brother of Belle Sparks. Frederick “Frank” Revelette’s parents were Pierre Carbaneau Revelette and Mary Louise Roy, daughter of Louis Roy and Julia Royer (French, Osage and Kansas descent), and sister of other Roys who had a number of Osage descendants in the area, including John Baptiste Roy who had married Pagrachenah, said to be Ioway-Osage. Other relations of this family were living beside George’s sister Addie as well as other relatives. 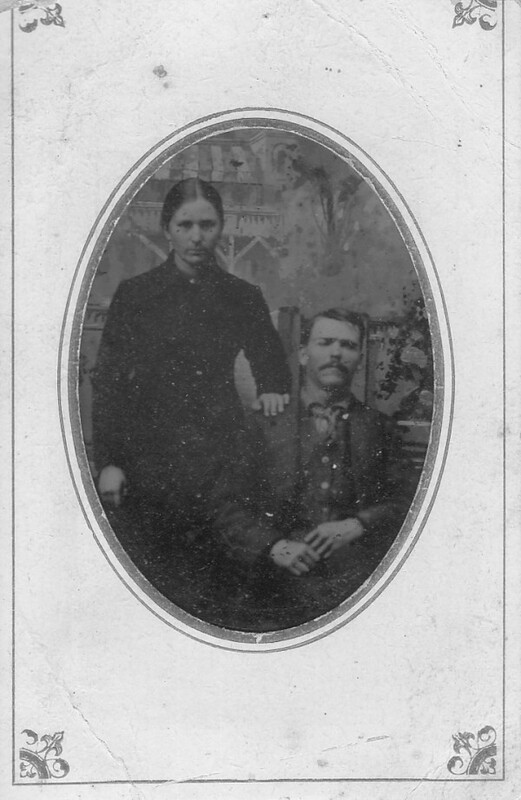 For instance, the family of Joseph Richmond Pearson and Rosa Lee Denoya had been residing between Addie in the Osage area in 1910. Rosa was a granddaughter of Julia Roy, Mary Louise Roy’s sister, through Francis Denoy and Martha Lessert. With the story of G. W. Jr’s mother being Ioway, and with their location in the Osage area, I have considered that the story of G. W. Jr. having once been a mayor of Chautauqua is instead perhaps garbled knowledge that G. W. Jr. was in some way related to the family of James Bird Jones and Laura Mae Revelette. So far I’ve only located George Washington McKenney Jr. and Sr. in the 1885 census, not George Jr’s family, which makes me wonder if they could possibly be in Oklahoma at this time. Mable Clair was born in 1888. Her obituary gave the family as living in Pawhuska when she was a child. By 1897, with Carrie Isabel was born, they were in Kay County, Oklahoma. The family was back in Chautauqua County, Oklahoma by 1900. John L w m Dec 1852 47 single b. Ind. Father Ind. Mother-Ind. William E. w m Aug 1876 23 single b. Kansas father-Ind. Mother-Ind. ATKINSON Benjamin ? (uniintelligible, written through) and Mary E.
Clarence E. son Oct. 1896 3 b. I.T. Kittie L. daughter Oct. 1897 2 b. I.T. The 1905 lineup shows the Osage Revelettes. The Lynns. J. L. Henderson with a Rena Canville in the household and she would have been Osage. 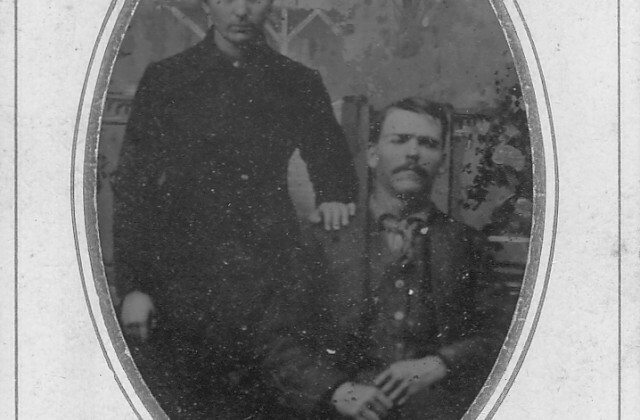 Then the family of William Leo Callahan whose mother was Louisa Monica Julia Canville, Osage, daughter of Andrew Bernard Canville and Mary Louise Tayrien, and was in the household as M. Ferrell. (Cornelius Callahan, another child of Julia Canvilles, was residing a couple doors from George and Belle in 1930). Chautauqua County had its share of mixed Indian families–in particular, French-Indian families, lines extending back to the late 18th and early 19th centuries, who tended to be listed as white in the Chautauqua County census, but were Osage enrolled and listed as Osage when down in the Osage area, for they moved back and forth or had family in the Osage area that was listed in the census as Osage. In 1908 their daughter Mable married Frank Tripp. G. W.’s father is living in the household in 1910. They are both given as James. Clara Sparks is also in the household. This would seem to be Belle’s mother, Carrie, given as widowed, though she was still married and was also enumerated with her husband in this census. A peculiar situation, I’m not sure what’s going on there. SPARKS Clara (reads may be mother’s sister) f w 76 had 9 children, 4 surviving, b.Ind father-Ohio mother-Maryland. Born about 1836. Haven’t a clue who this is unless it is Belle’s mother, Carrie, enumerated twice in this census for she is observed living with her husband (noted below). Carrie’s parents were however born in NC and MD. And then also the Clara here is given as a widow. Belle and G. W. did name a daughter Mable Clair. Is it possible she is named for this Clara? In 1920 G.W. McKENNEY and Belle are living next door to daughter Carrie Isabel. Georgie’s sister, Addie, is a few households away, giving herself as widowed, though she is still married (her husband gives himself as widowed in the 1930 census). NOTE: In this census, Addie MCKINNEY MCWHIRT, sister of George Washington MCKINNEY Jr., is living four households down from Joseph MCKINSEY. NOTE: Martha Eliza CROCKETT, sister of Samuel Kelly CROCKETT (James Albert MCKENNEY’s father-in-law), married W. F. LEMMON. A daughter, Ermie LEMMON, married William G. JACK. NOTE: A daughter of Joseph is shown as being an Opal HAMPTON, who had married John R. HAMPTON. Belle’s daughter Carrie married Jesse C. HAMPTON in 1916 and it is possible John R. was a brother. Florence PERSHALL MCKENZIE was the sister of John Wesley PERSHALL m. Lucretia Jennie Kirkpatrick, whose mother Zilpha Strickland was the sister of Millie Ann STRICKLIN who married James Kelly CROCKETT who was the grandfather of Vera who married James Albert MCKENNEY, Belle’s son, in 1904. I am a daughter of the Revelette family. My mother I am interested in the connection. I was perplexed by the spelling of Revelett vs Revelette. First names of decendants are correct. Any stories would be fun to pass to my family. Hi, Suzanne, thanks for remarking here that the accepted spelling is Revelette. And it was such on the Osage Rolls consistently from early on. In the 1900 U.S. census the James S. Revelette family’s spelling was given as Ravlet. In 1905 it was Revlett. In 1910 it was Revlett. In 1910 it was Revelett. In 1920 it was Revelette. The father’s spelling in the 1900 census on the Osage Reserve was Revelett. His brother, Francois Xavier Revelette, was in the 1870 census as Revelett in Canville, Neosho, KS. As for the different spellings on the U.S. and state censuses, it was not at all uncommon for spelling of names to be all over the place in censuses up until about 1910-1920. My family’s name was vacillating between McKinney and McKenney on U.S. and state censuses until 1910 when it was finally standardized as McKenney. I wish I had some stories to pass along but I haven’t any! I will change the spelling to Revelette in my post.